Learning how to communicate with a person living with dementia is not easy. I started to feel like a hamster running on a treadmill. I seemed to be going no where fast. I finally decided to get off the Alzheimer's treadmill. Here is how I did it. Change is difficult under any circumstance. It is even harder when you need to change something that you have been doing all day long throughout your life. Every Alzheimer's caregiver I ever met has talked about their need to vent. Venting is a good thing. You get the monkey off your back. However, at some point you need to make a decision to put that monkey in the closet and get off the hamster wheel. If you have gone years complaining about the same behavior over and over you must ask yourself, how do I change this dynamic? Change? How do I change what is happening? Two of the behaviors that drive the Alzheimer's caregiver crazy are repeatedly hearing the same question over and over, and hearing mean spirited words. We all face this. In the real world when someone says something mean it usually starts an argument. Even if the person didn't really mean what they said. If someone engages in a behavior that you find unsettling, you will usually respond with harsh words or in a mean tone of voice. When an Alzheimer's caregiver responds harshly to someone living with Alzheimer's disease they usually regret doing so. This in turn makes them feel guilt and remorse. When you start living a life full of guilt and remorse it is likely that your whole world is going to turn negative. Negativity breads more negatively. One of the things that drove me crazy was when my mother would say over and over -- I'm hungry, I'm starving. Of course, like just about every Alzheimer's caregiver, I would respond by trying to tell my mother she just ate, or maybe say something even worse - you can't possibly be hungry you just ate. I knew I had to do something. I understood that I had to change. I understood that I would need to develop an entirely new set of communication skills. I knew it wouldn't be easy, and it wasn't. It took years, and I a still working on it. I discussed how I started building a new model of communication to better understand Alzheimer's. Today, I am going to discuss how I developed a simple image in my head that allowed me to switch seamlessly from communicating in real world to communicating in Alzheimer's world in an instant. This is how I got myself off the Alzheimer's Hamster wheel. It all started when I started thinking of myself as a hamster. Before I made it to Alzheimer's World it seemed that no matter how hard I tried to communicate effectively with my mom - I usually ended up making matters worse. When I made matters worse, my mom would go into her room and curl up into a ball in bed. I would go out in the living room, and I took my stomach ache with me. I would just sit there and feel worse and worse. Unlike in the real world, where you might be able to apologize or reason with a person and dismiss the bad feelings, this rarely works in Alzheimer's world. I just kept thinking to myself, I am like a hamster on a hamster wheel. I kept running and running until I got exhausted and when I was done, I realized I went no where fast. Over and over, I went no where fast. I just couldn't accept this and I wanted to change. When it would all start, the meanness, the repeating of the same words over and over, I would bring up the image of the hamster on the wheel in my mind. 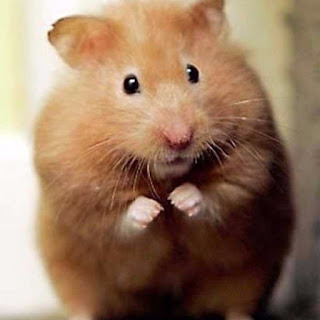 I saw the hamster running and running around the wheel. Going no where fast. There was one big difference. The hamster in my image was me. There I was, right above my head going no where fast. And then it happened. I brought up the hamster that was me and my communication changed. It was subtle at first, I had finally convinced myself that I didn't want to be a hamster any more. I guess you could also say, there came a time when I refused to be an Alzheimer's hamster. I brought up my hamster image whenever I needed to, and I then crossed coolly and calmly into Alzheimer's World. I was no longer bent out of shape; instead I would get calm. Very calm. I spoke in a low, confident voice. I brought her around slowly but surely. Although, I sometimes thought it was me bringing me around slowly. The bottom line, I take control of the situation instead of allowing the situation to take control of me over and over and over. I started accepting that when my mom said she was hungry, she was hungry. Instead of correcting her I said, okay we will eat in a little while. Believe it or not, it worked. She was satisfied with the answer; and, I was no longer bent out of shape. Think about it. All I had to do was adjust my thinking. Or maybe I should say, I started using my brain. I had accepted my mom's reality. From that point on I started to learn how to communicate with a person living with dementia. I realized the less I said, and the better I listened the easier things become. If you are an Alzheimer's hamster right now, don't feel bad. Most of us start out that way. Here is the good news. You are the ONE that gets to decide. Stay on, or get off the wheel. The hamster has no choice. You do.